I traveled to France twice to get this picture of the famous white horses of the Camargue. The first time I traveled there at the end of June, and I thought I could photograph the beautiful lavender fields of Provence as well as the horses in one trip to Europe. I didn’t research this carefully enough because the water in the marshes during mid-summer is too low, and when the horses run they are immediately covered in black mud. In addition, the drier conditions mean that the dynamic turbulence of the water is lacking. All I got was a little mud kicked up by the horses’ hooves. Not a pretty picture. Like most serious shooters, when I get an image in my mind, I can’t rest until I can capture it. The following year I returned in April, making the same arrangements with the French farmer to run his horses through a marsh in beautiful sunset lighting. This time everything clicked. My photographic strategy involved careful planning. On my first trip, I used a 70 – 200mm f/2.8 Canon lens. I figured as the horses ran toward me I would wait until they filled the frame before I started shooting. I reasoned that the zoom would give me flexibility in composing, and the 200mm focal length would provide sufficient depth of field so if the horses became somewhat staggered, they would still be sharp. I overlooked one factor, however. 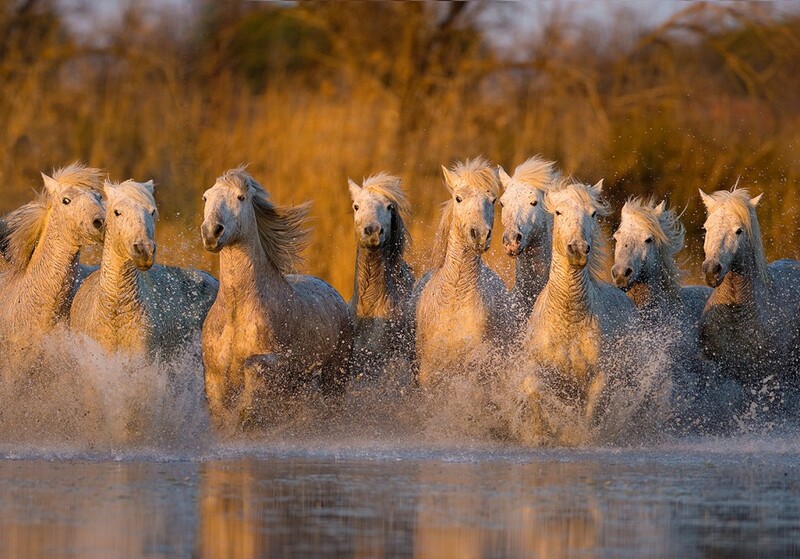 When horses run, they don’t remain in a tight group. They disperse to a certain degree, and that’s not what I wanted. The image I saw in my mind was a tight group of horses approximately equidistant to the camera, and that’s what I was trying to capture. 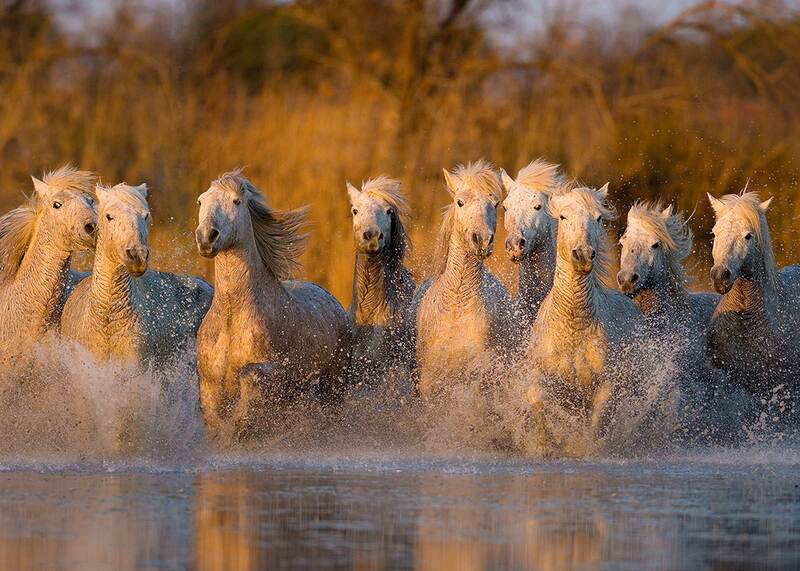 The horses were lined up at the starting point about a thousand feet away at the far shore of the marsh, and as soon as they took off — in spite of the best efforts of the French cowboys — the horses on the ends spread out. By the time they got within 200mm telephoto range, I was only able to capture at the most five horses in a tight group. Therefore, the second time around I used a 500mm f/4 telephoto. I was now able to fill the frame with the lineup of horses before they starting running. As soon as the water started churning, the motor drive on my camera came to life. The more difficult issue was focus. When subjects are moving directly toward the camera at a fast rate of speed, critical focus changes every millisecond. The question was, can auto-focus be trusted to keep up with the constantly changing focal points? My experience is that this depends on the speed of the subject, the subject’s size in the frame, the number of auto-focus points used, the technology built into the lens, and the AF technology built into the camera body. In other words, there are too many unknowns. I then asked myself if I thought my hand-eye coordination was fast enough to focus on the running horses manually — faster and more accurately than the camera’s auto-focus function. I didn’t know the answer to that because I had never done it. Besides, even if I had done it once didn’t mean I could do it again — more unknowns. In the end, I decided to trust myself. I turned the auto-focus mechanism to manual, and as the horses took off, I fired three to four frame bursts before quickly refocusing and shooting again. It worked, because I got many frames tack sharp. The 500mm lens was only good, though, for the first few seconds. As the horses quickly approached the shooting position, I was just too tight and couldn’t keep up with the focus at all. Here is where a 200 to 400mm zoom would have worked nicely. Nevertheless, I got the shot I wanted with the 500mm lens. The lighting was also critical. I scouted the marsh to make sure the sun in the late afternoon would be at my back with the horses being front lit. This gave me enough light for a fast shutter speed plus the beautiful golden light. I used a shutter speed of 1/640. Depth of field wasn’t a critical issue because the horses were far away, so I shot wide open at f/4. This allowed me to minimize the ISO to 200 for maximum picture quality and a minimum of digital noise. Amazing shot. I’m glad you were able to capture it the 2nd time around how you envisioned it. Great shot! I’ve seen this in my minds eye and you’ve captured it brilliantly. Thanks for the tech rundown. You do a first rate job telling the secrets behind your outstanding images. A beautiful capture as it was well planned. Were you shooting on a tripod and approximately how far were you from the start of the shoot? Thanks for your expertise. Very nice shot. Thank you for letting us know how you put it all together.